Update 1:50pm PT: ThinkGeek's sale has been live for less than two hours but already all of the bundles are out of stock. In fact, each bundle's page says, "This product is no longer available," with another line adding, "Unfortunately we don't carry this item anymore[.]" 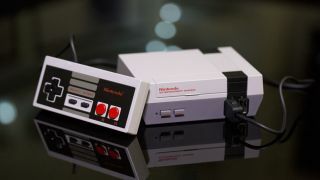 We've asked a ThinkGeek representative when more NES Mini consoles could become available, and we'll update this story if we hear back. Upset you missed out on buying an NES Classic Edition before Nintendo ended production for good? Cheer up, because we've got good news for you. ThinkGeek has got its hands on the Nintendo Classic Mini, and it's selling the tiny, nostalgia-fueled console in six bundles. The bundles all include an NES Mini along with Nintendo-themed merchandise. Note that ThinkGeek's supplies are going quickly, so if any of these grab your attention, we suggest acting fast. There's a limit of one purchase per customer, and sales are only available to those in the US. If you miss your chance now, there's always the SNES Classic Mini to look forward to when it launches on September 29. But be warned: just like the NES Classic before it, pre-orders for the tiny SNES are already selling out. NES Classic Edition plus Tetris lamp and book for $149.99 Yes, the NES Mini will provide you hours of interactive fun. But the stackable LED Tetris desk lamp included in this bundle is also awesome, if not a procrastination sink-hole waiting to happen. You'll also get a copy of Playing with Power, as if you needed another reason not to get work done.